Shabaka Hutchings is on a roll. Everything the British saxophonist touches seems to come stamped with one or both of the following: “the leader of the new wave of British Jazz” and “The Kamasi Washington of the UK”. He is, without a doubt, on one hell of a roll. I mean, I’m sure fans are beginning to find the Kamasi Washington comparisons tedious, I know I am – hell, maybe even Hutchings is – but he does seem to be creating a unique buzz (for jazz) in the same way Washington did when he unleashed The Epic. Each of the bands he leads – electro-jazz trio The Comet Is Coming, spiritual jazz ensemble The Ancestors and the world-jazz fusion quartet Sons Of Kemet – have now been signed to Impulse! (part of Universal), and each one has received widespread acclaim. And not just in the UK, but in Europe, The States and beyond. 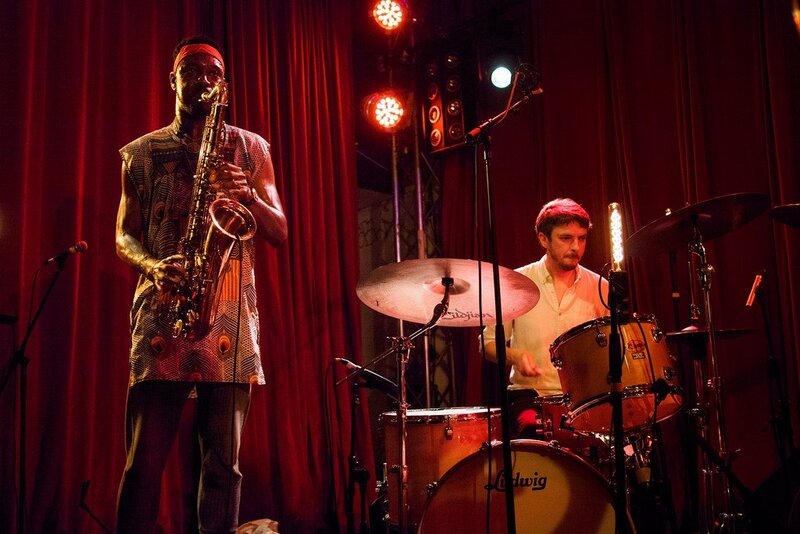 Everyone keeps saying that everyone is talking about what’s going on in the British jazz scene, which means everyone is catching onto Shabaka Hutchings, as he really is at the centre of the whole “explosion” (just check out the Brownswood comp, We Out Here, he oversaw). Sons Of Kemet is his biggest success and their latest record, Your Queen Is A Reptile, is undoubtedly their fullest, most forward-thinking statement yet. Tonight’s gig in Berlin – upgraded from Privatclub to the Lido after tickets flew off the shelves – features a set heavy on this new material, unsurprisingly, and what follows is a thrilling, upbeat celebration of where jazz is going. On paper, one might think that a quartet featuring sax (Hutchings), tuba (Theon Cross) and two full drum kits (Tom Skinner and Eddie Hick), might be lacking warmth or heart in the live space, without a bass or keys to cut through the noise, but the fact that Sons Of Kemet are able to create such a complete sound only adds to their excellence. In leu of a bass, Cross’ unique, otherworldly tuba playing powers the whole sound, while the drummers fire off-kilter world beats at each other, overlapping but never overpowering each other. And, of course, Hutchings’ sax provides the focal point: accessible, whether smashing out a melodic hook or a wailing solo. Sons Of Kemet are undoubtedly a jazz band, with innate jazz sensibilities, feeding off each other and the audience, but in truth they make a sound much closer to world-fusion, mixing together elements of 2-tone ska, Afrobeat and Caribbean music, as well as subtle elements of contemporary British genres like dubstep, bass and UK hip-hop. If it’s unrelenting in its tempo, it’s because their music is brim-full of passion, stemmed from the fierce social commentary that inspires Hutchings writing. It also creates an electric atmosphere, with the attendees dancing and cheering like they can’t decide whether they’re at a party or a protest. And on a Tuesday, no less. With a new Comet Is Coming album coming next year, Hutchings’ star is unlikely to diminish anytime soon, but make sure you catch Sons Of Kemet during this cycle – on this form, they are as good as it gets for live jazz.